Kampong Mukut is not very big and does not have many inhabitants either. The main livelihood in this friendly kampong is fishing. When we woke up, it was quiet in the kampong, because the men were at sea to catch fish. They returned around 10 o'clock. In addition to fishing, the residents here have a chalet farm, beekeeping and one guide for foreign tourists. It is a sleepy little fishing village, which has changed little and was recently discovered by tourism. 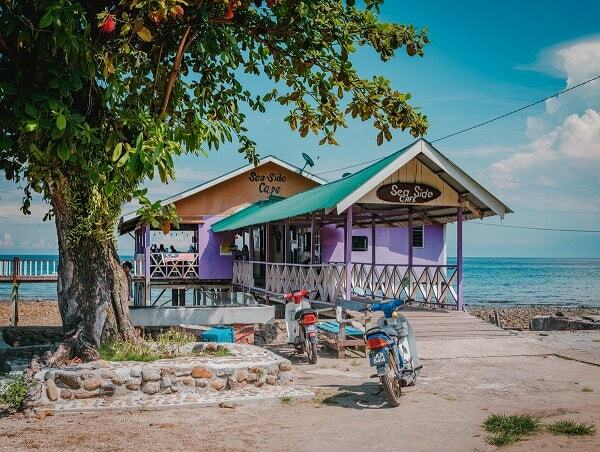 It has an authentic old-school mentality and the slow pace of life is hard to beat, even on Tioman. If you like peace, nature and traditional village life where time has stood still, then Mukut is the place to be. There is no direct ferry, which sails to Mukut. You have to get off the ferry at Genting and then take a small water taxi to Mukut. So it takes more effort to reach Mukut, but the nearby spectacular Asah waterfall and the unique Twin Peaks of Tioman make a visit to Mukut more than worth it. 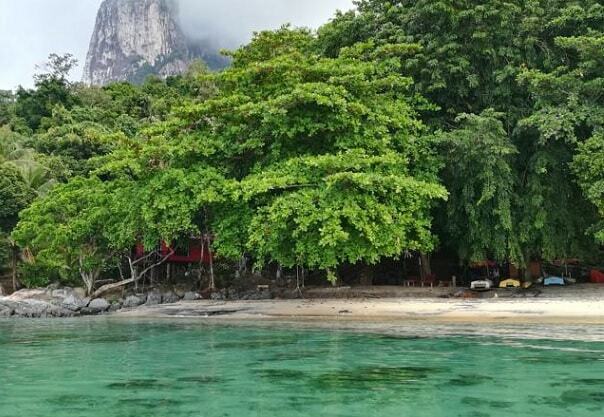 There are also beautiful small stretches of beach in Mukut, which you will enchant and which you might as well call your own private beach, they are so breathtaking and secluded. You will encounter few tourists here, who sunbathe here. You can rent snorkel equipment from the villagers in Mukut, so take a dip in the clear water here. The guesthouses and chalets in Mukut are reasonable, but simple. Most chalets only offer fans on the ceiling and cold water showers. The meals in the restaurants in Mukut are of the traditional Malay type, that is to say, there is usually delicately flavored rice served with fragrant fish, usually with a large dollop of peppers. Eating and drinking in eg the Sea Side Caf� is fairly cheap and in buffet form. You can choose your own portion. The restaurant on the coast formed the stage and atmosphere, while the food was cool. But this was due to the fierce sea breeze. You can also look at the underwater landscape here. 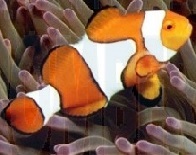 You can see different shapes and colors of large and small fish swimming under the restaurant. Some of us will see a baby shark approaching the restaurant for a meal. The foreign tourists come here to snorkel, dive, walk, fish, climb, for the variety of flora and fauna, or to view the waterfall. The restaurants by the sea provide various drinks and cheap and tasty food. The clean water comes from the waterfall. Who comes to Mukut in the months of March to August, has the chance to see turtles at night, who lay eggs on the beach. In the months of June/ July there is always an abundant harvest of mangos. The population is generous and will certainly let you taste the mangos. The highest waterfall of Tioman is the Asah waterfall near the village of Mukut. Against a lush tropical rainforest background the Asah waterfall is the most beautiful and famous waterfall of Tioman. The Asah waterfall is so photogenic that it could be seen extensively in the Hollywood Blockbuster 'South Pacific' in 1958. The swimmers at Asah waterfall provide a refreshing dive, which makes you feel completely relaxed. So if you are looking for a cold water dip to improve your blood circulation and increase your energy levels, then Asah Waterfall is the place to go. 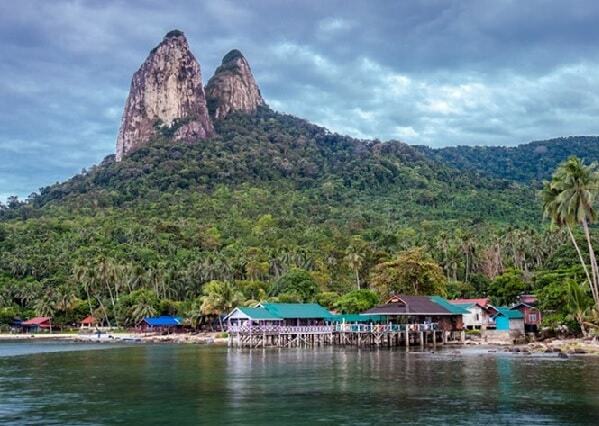 The famous "Dragon Horns" or "Twin Peaks or Gunung Semukut", is the most striking natural landmark of Pulau Tioman. These two gigantic granite peaks over the south coast of Tioman at about 700 meters altitude, with sharp pinnacles that resemble the horns of a dragon. The two peaks are part of the Gunung Semukut. 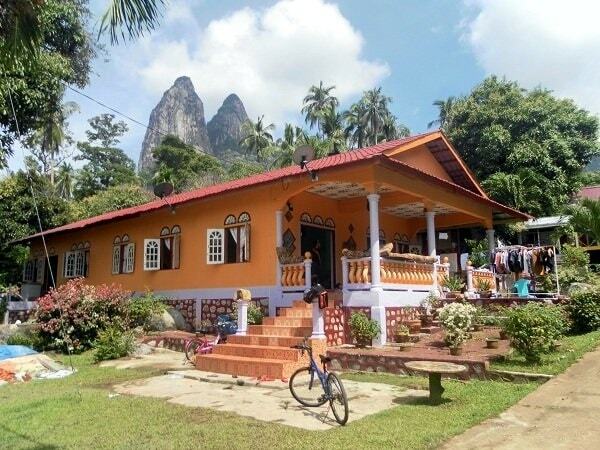 One of the most popular climbing destinations of rocks in Malaysia. The path starts in Kampong Mukut and divides into different routes to climb Mount Semukut. Unfortunately, climbing to the top of the peaks is reserved for real mountaineers, who climb with ropes and hooks, but the journey to a beautiful viewpoint between the mountains takes two hours. The view and trip is worth it. The horns of the dragons or the Twin Peaks of Gunung Semukut. There are several legends about the origin of these two peaks, which are told by the villagers of Mukut. One legend tells about two dragons, they were in love and they wanted to flee their parents. However, the female dragon was not allowed to hear the sound of a crowing rooster. They fled via the Chini lake and over the Pahang River. During the journey, one dragon thought that he had forgotten a piece of cloth, the cindai cloth, and returned to collect the material. This silk cloth offered protection against evil. Unfortunately, the retreat heard the sound of a crowing rooster. Immediately the female and the male dragon turned into a mountain: the two peaks of grandmother Semukut. The other legend about dragon horns tells of a dragon who fled because he had lost the war. His partner followed him until she found him. But on the way back they were caught in a trap. They were cursed and they became the two peaks of grandmother Semukut. The last and most heard legend tells of a Chinese princess, who was stunned by the blinding beauty of her friend. She spread her enormous wings in China to visit her beloved in Singapore. On the way she decided to rest on Tioman, because she was charmed and stunned by the beauty of the island. This changed into the two peaks of grandmother Semukut.